We admit it: As cooler weather moves into our part of the world, we turn into soupaholics. And this hearty curried soup is becoming one of our faves. We made it with odds and ends we happened to have in the refrigerator (some leftover roast chicken and half a head of cauliflower that needed using). Best of all, we put it together in about half an hour, so it made an easy weeknight dinner. And it tastes way better than anything you can buy in those red-and-white cans. As is typical with Indian-style dishes, this soup does have a bit of spiciness to it. But it isn’t particularly hot. If you want to make it spicier, just increase the amount of cayenne pepper and/or the number of jalapeño peppers. This recipe assumes you have some cooked, leftover chicken on hand. If you don’t, supermarket rotisserie chicken would be an excellent substitute. We’re using chicken as a background flavor in this soup, so we don’t use a lot. But you could double the amount (or even triple it) if you want a more substantial soup. For a vegan version of this dish, you could substitute canned chickpeas for chicken, and use water instead of chicken stock. Prep time for this dish is about 10 to 15 minutes. Cooking time adds another 20 minutes or so. This recipe makes about 6 generous main-course servings. Leftovers keep well for a few days if refrigerated in an airtight container, or for a month or two if frozen. Peel the onion and cut it into dice of about ½ inch. Set aside. Peel the garlic and mince or slice it finely. Set aside. Wash the jalapeño peppers and cut them lengthwise. Use a teaspoon to scoop out the ribs and seeds (be careful, the oil on these is hot; keep fingers away from your eyes). Mince the pepper roughly (you may want to reserve a few slices for garnish) and set aside. Then wash your hands with soap and water to remove the hot oil from your skin. Wash and dry the cauliflower. If you have a whole cauliflower, cut it in half and reserve one half. Cut out the woody core, then cut it into small flowerets. Set aside. Cut the chicken into dice of ½ inch or a bit less. Set aside. Measure out the coriander, cumin, turmeric, and cayenne pepper. Set aside. Place a large soup pot (4-quart or larger) on medium stovetop heat. When the pot is hot, add the oil. Then add the diced onion. Season with salt, and sauté for 8 minutes. Add the garlic and jalapeño pepper, then sauté for another minute or two. Add the coriander, cumin, turmeric, and cayenne pepper. Stir it into the onion mixture and sauté for a minute. Add the chopped cauliflower and chicken. Stir to combine with the onion mixture. Add the diced tomatoes and chicken stock, and simmer until the cauliflower is becoming tender but still has a bit of crunch – about 10 minutes. About 3 minutes before you serve the soup, add the peas to the cooking pot. When the peas are cooked, taste the soup and adjust the seasoning if necessary. Ladle the soup into serving bowls. Garnish each bowl, if you wish, with a slice of jalapeño pepper or a handful of chopped cilantro. Sometimes soup can taste a little flat, and adding more salt doesn’t usually help. Instead, we like to add a bit of lemon juice – maybe a tablespoon. The acidity helps brighten the flavor. You could also use red wine vinegar, or balsamic vinegar. We use kosher salt for cooking. Kosher salt has bigger flakes than table salt, so it doesn’t fill a measuring spoon as “tightly.” Hence, it’s less salty by volume. If you’re using regular table salt, use only about half as much as we suggest. You can add more later if necessary. The addition of fresh ginger would be good in this soup. Use a piece measuring an inch or so long, peeled and finely minced. Add it when you add the garlic in Step 7. If you have cooked potatoes on hand, they’d also make a nice addition to the soup. Dice one or two and add them in Step 9. Leftover roast pork would also work nicely in this soup as a substitute for chicken. “Soup is such comfort food,” said Mrs. Kitchen Riffs. At least we’re not opening a bottle of Southern Comfort. The bright colors of those photos really support your thought: “And we need something to take comfort in,” I said. “Especially during this very, uh, uncomfortable election season.” I'm thinking soup too. And fearing election results despite the encouraging polls. Hi Sue, multi-colored cauliflowers are fun to play with! Love the way they look. And taste. :-) Thanks for the comment. Hi Mae, we really do need a whole lot of comfort at the moment! And this soup delivers. :-) Thanks for the comment. Nice flavors and textures in this hearty and filling soup. Yum! Hi Pam, doesn't this look good? We loved it! :-) Thanks for the comment. Hi Pat, curries are so much fun! You'll like this, I think. Thanks for the comment. My kind of soup with exotic flavors! I would go heavier on the chicken for sure. Maybe served with a naan on the side, ok I am craving it now. Great recipe. I always have some pan seared chicken breasts in the fridge :-)) and cauliflowers happen to be one of my favourite veggies. This is totally right up my alley. We are soupaholics too! Have a pot of Chinese chicken soup on the burner now and chili in the crock pot. LOL Love this recipe! You know I am a huge turmeric fan so this soup is right up my ally. In addition, I love your idea of adding a little acid like lemon to the soup to give it a little perk. Great idea and great recipe. Sharing!!! Dinner in less than an hour, you have my undivided attention! Especially with all those scrumptious warming flavors. A wonderful dinner for the first cool days of autumn. Hi Evelyne, naan would be great with this! And I can totally see why you'd find more chicken appealing -- it'd be good. :-) Thanks for the comment. Hi Angie, isn't cauliflower good stuff? One of our favorite veggies! Thanks for the comment. Hi Bobbi, just a touch of acid can make such a difference. And turmeric is wonderful -- we've been cooking a lot of Indian lately just to increase our consumption of it. Thanks for the comment. Hi Deb, we like to cook, but always enjoy having a bunch of quick recipes that don't require that much time to prepare. And this is a tasty one! Thanks for the comment. Definitely a low carb dish... yet comforting and warm for these chilling days. Hi Denise, this is rather low carb, isn't it? And awfully good! :-) Thanks for the comment. Hi Taruna, curried anything is delish, isn't it? Love the flavors in this! :-) Thanks for the comment. Hi Greg, soup is, well, souper. :-) Love it at this time of the year! Thanks for the comment. There's that wonderful cauliflower again. This soup would be perfect here in Australia right now, John. Even though it's spring, we had frost this morning! What a gorgeous soup, our weather turned quite chilly over the weekend (had the heat on most of the time!). I adore soup, particularly this time of year. Indian spices in a richly flavoured brothy soup is right up my alley. Thanks John. My name is Lea Ann and I'm a soupaholic. And they're good for you. Usually brothy and so full of fresh veggies. I love the color of this one. Thanks for sharing John. Hi Liz, this is a great soup for frosty weather! And yes, we love cauliflower. :-) Thanks for the comment. Hi Eva, we haven't turned on our heat yet, but soon will, I suspect. Which is good -- it means more soup for dinner! :-) Thanks for the comment. Hello Lea Ann! :-) It's good being a soupaholic, isn't it? Thanks for the comment. Hi Merryn, we love us some jalapeño! :-) We've had a lot of them lately -- some friends gave us some from their garden, so we've been putting them in everything! Thanks for the comment. A cool front is passing through! I think it's officially soup weather. I'm loving this gorgeous twist on chicken soup. I am a soupaholic too when the weather turns colder. Homemade soup is always so much better than anything you can buy in the cans. This one sounds yummy. Great comfort food. Hi Liz, this actually started as chicken noodle soup until I remembered I had some cauliflower in the refrigerator. And then became an Indian soup! :-) Thanks for the comment. Hi Dawn, this is such a nice soup -- great flavor. And it's gotten really chilly here, so may have to make it again! :-) Thanks for the comment. What a great looking soup. I love all the spices , just right for the cooler and rainy days. I love a splash of balsamic vinegar in soups - it really does the trick. 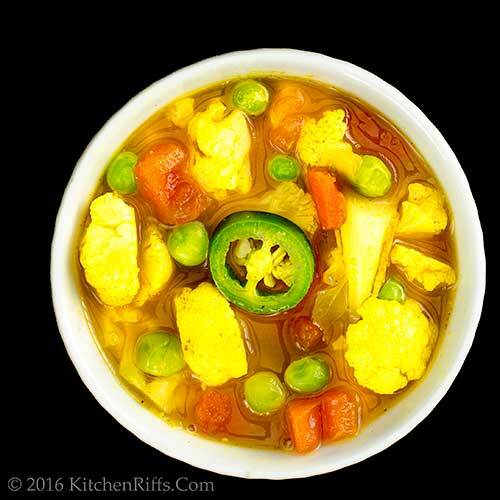 The color of this soup is so inviting and the cauliflower is stunning! We love soups in the fall and winter too - there is nothing better. Thanks for the inspiration John! Hi Kristi, Indian dishes have so much flavor, don't they? We love them! Thanks for the comment. Hi Gerlinde, nice and cool here today -- which means more soup! :-) Thanks for the comment. Hi Tricia, the color on this is almost as good as the flavor! Both really nice. :-) Thanks for the comment. I really need to use tumeric more. There is a jar in the pantry, but it just never finds its way out. This soup look like a great way to use a little of it. Very hearty and warming for sure! Hi MJ, cook loads of Indian and you'll start using that turmeric. :-) Thanks for the comment. Hi Smitha, yup, at this time of the year comfort food rules! Thanks for the comment. I've also been making more soup lately as it the weather gets colder. 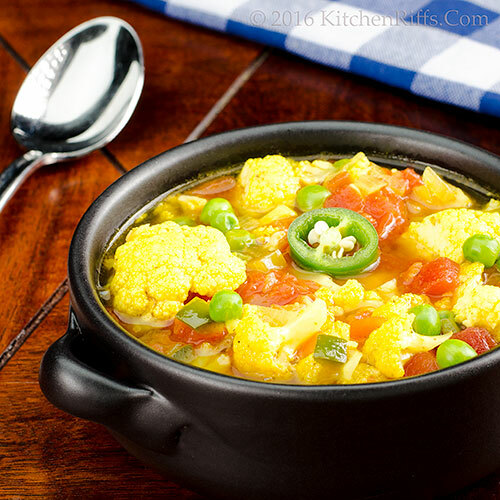 This curry soup is something I can eat any day of the week and I love how cauliflower soaks up all the flavor and just bursts in flavor when you bite into it. Great recipe for this time of the year! This is really on time, cold weather is coming on us and nothing feels better than a warm soup. I like mine with more cayenne and yes some potatoes will make it a family fav. Thank you. Hi Yi, cauliflower is terrific in soup, isn't it? Lovely its flavor, and you're right -- it does soak up loads of flavor from all the ingredients. Thanks for the comment. Hi Amira, potatoes are wonderful in this! As in more cayenne. :-) Thanks for the comment. I love cauliflower and curry together! Such a great combo and soup is perfect for this time of year. My soup making has increased lately too even though it hasn't cooled off much here yet. This looks like a great one to add to the roster! Love the colors. I'll take this soup over election season ANYTIME. But seriously, love the Indian flavors in here! Yes, please! I'm with you guys, soup is the best! I agree that sometimes it can be a little flat and I've used a squirt or two of lime as well. This looks and sounds so delicious that I don't think you have to worry about any additions here. Hi Laura, we're really in love with that flavor combo too! SO good. :-) Thanks for the comment. Hi Juliana, being a soupaholic is fun, isn't it? :-) Thanks for the comment. Hi Lisa, it'll probably be a month before it's really soup weather where you live! But it's coming. :-) Thanks for the comment. Hi Ala, yeah, we've had quite enough of election season. :-) Thanks for the comment. Hi Robyn, LOL! There might be a demand for those houses. :-) Thanks for the comment. No need to 'trump up" this soup with any additional ingredients- it's got all the delicious essentials! Hi Fran,:-) Thanks for the comment. I love using turmeric in my recipes. 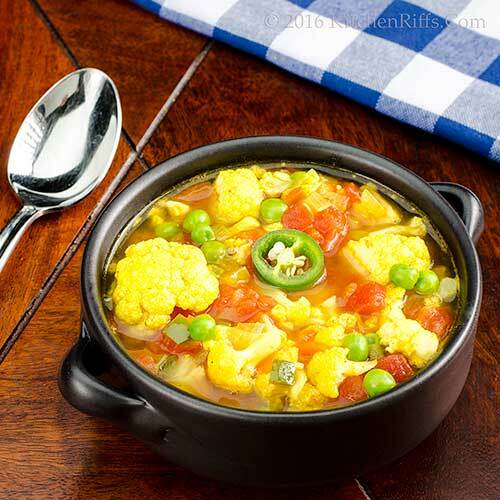 This curried cauliflower and chicken soup sounds so very delicious, hearty and comforting. Nothing can makes us feel better on cold day than a warm soup — perfect for this time. Anu, turmeric has a lot going for it, doesn't it? And soup is wonderful on a cold day! :-) Thanks for the comment. Hi Marcelle, this soup actually started as a classic chicken noodle, but as I was assembling ingredients took quite a turn! :-) Thanks for the comment. Hi Carolyn, we usually puree cauliflower in sou, too. But then wondered why? Hence, this. :-) Thanks for the comment. I'm with you, a fellow soup-aholic and this one sounds amazing! I echo that sentiment. I would rather have the cauliflower the way you've done it. Thanks for the soup recipe! It certainly is becoming soup weather. Love curry and cauliflower combos. We may all need to open a few bottles of hope (booze) before November 8 gets here! Hi Jeff, "chunky" soup is better, isn't it? Certainly looks better, and the mouth feel seems better, too. Thanks for the comment. Hi Scott, soup really is addicting, isn't it? Good thing, since they're so good! Thanks for the comment. Hi Debra, a few bottles of hope are much needed right around now! Thanks for the comment. I love all the flavors in this soup. I wish my husband was a fan of curry and wish there was some way to sneak it into dishes but the flavor is so pronounced. Maybe for my next ladies luncheon I can sneak in some curry and please myself. Beautiful soup! Hi Vicki, no hiding the flavor -- or color! -- of curry, alas. Thanks for the comment. I really love Indian flavors, especially with cauliflower. This soups looks perfect for a chilly day! Hi Amy, cauliflower and curry is a wonderful combo, isn't it? :-) Thanks for the comment. Hi Ritu, are you sure you can wait until this weekend to make this? :-) Thanks for the comment. 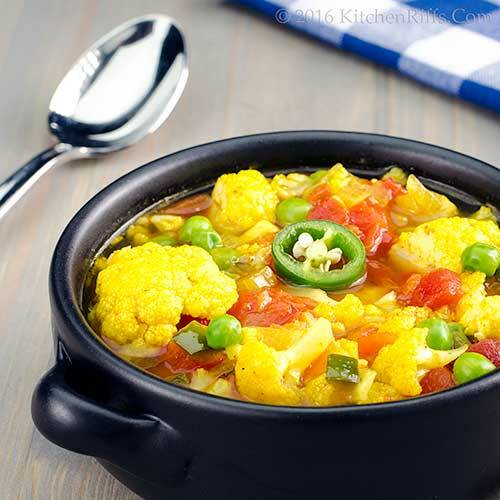 I love all curries and what a wonderful idea to make a soup, cauliflower is perfect in this. Thanks John. Hi Cheri, is is a wonderful soup! SO flavorful. :-) Thanks for the comment. Soup is absolutely the best comfort food and I'm loving the Indian spices you use here. We already have snow in the mountains so soups and stews are very welcome! Hi Hannah, snow? You need some of this! :-) Thanks for the comment. This sounds so good and is just the recipe for autumn to warm you up! Hi Caroline, love this soup! SO nice on a cool day. :-) Thanks for the comment. I love your suggestion of adding a little lemon juice to brighten the soup. Lemon is a secret weapon, isnt it? ANd I just learned you can feeze them! A revelation. Hi Rosemary, lemon really is a secret weapon! That little jolt of acid can really brighten up a dish. Didn't know you could freeze lemons -- have to try that! Thanks for the comment. Hi John, Indian food is great! We love its spicy flavors. :-) Thanks for the comment. That looks chunky delicious! certainly it looks like autumn there now. Hi Raymund, we've had a weird autumn -- some cool days, and some days when it's much warmer than usual. But still plenty of soup weather! Thanks for the comment. Watching the debate tonight, I could certainly use a bowl of this comforting soup! Hi Kristi, we had some people over for the debate -- I think we ALL needed a round of this! Thanks for the comment.